Together with Skiathos, the islands of Skopelos and Alonissos are the only really inhabited islands of the Sporades and indeed also the main attraction for a vast number of tourists that are attracted to the superb beaches of these pristine islands. You will start your sailing holiday out of Skiathos port which is the main yacht charter base in the region. The distances between the islands are very short and together with a similar lushness and green fertile appearance these island can be compared the Ionian islands to the west of Greece. Sailing holidays in the Aegean can however be affected by a Meltemi during late July, August and early September. Outside the main season these Sporadic islands are absolutely magnificent. Furthermore, the Skopelos restaurants are well known throughout Greece for there gourmet food. The islets east of Alonissos are part of a marine nature reserve, which protects birds, fish and especially marine mammals (Dolphins, Whales and the Mediterranean Monk Seal). Note, that the more common name Alonissos is sometimes spelled as Allonisos or Alonisos. The photo above was taken while sailing from Panormos bay in Skopelos to Patitiri port on Alonissos. 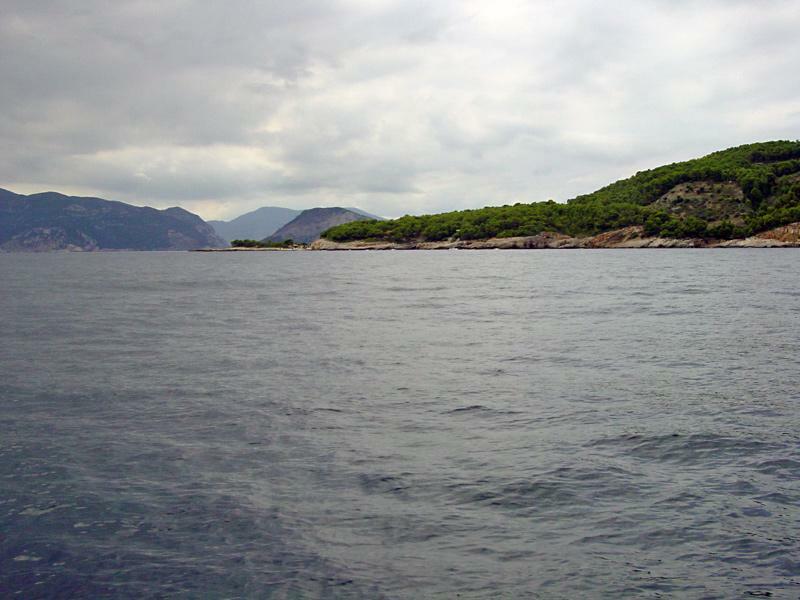 On the foreground the western tip of Alonissos. Directly behind is Camel island (Nisos Agios Giorgio) and the darker mass on the left and the faded area in the background is Skopelos. Right around the darker cape is the entrance to Skopelos bay and the port.